Give yourself four weeks of terrible movies, and eventually it pays off. Down a Dark Hall is the latest attempt to adapt one of Lois Duncan’s thrillers into a film. And this is my far the most successful at capturing Duncan’s intended message and tone. Young Kit is a “special” girl, who is probably more trouble than she’s worth. She gets into trouble, claims things no one else believes, and refuses to let her therapy work. As a last resort, her mother and step-father sent her to Blackwood Boarding School. She and four other girls (all trouble in their own ways) are introduced to a world of art, mathematics, literature and music. Initially, they’re all as talented as most teenagers – not at all. They struggle through their complex work, but soon enough certain girls begin to show an affinity for certain subjects. Izzy suddenly becomes a math genius, despite admitting that she nearly failed algebra the previous year. Sierra takes to painting, and Ashley takes on the writing skills of Romantic poet. Kit herself becomes a bit of a piano protégé under the tutelage of the super-hottie Jules, the son of Blackwood’s headmistress Madame Duret. Slowly the girls become obsessed with their work, but Kit senses something isn’t quite right. She begins losing large chunks of her memory, finding herself at the piano when she can’t remember how she got there. One night, Ashley screams in her room, and when the girls find her, she’s panicking, saying “Elizabeth” wasn’t with her anymore, but a man. When going to Ashley’s aid, Kit sees a figure disappear into the shadows in a corner. She then admits to the girls that she had a vision of seeing her father on the night he died. The girls, excluding the extra-dour Veronica, all admit to having similar paranormal experiences. And at that point, things at Blackwood only get worse. Kit and Veronica eventually team up to research Duret’s past. They learn that the girls are being used as vessels so that long-dead artists and great-thinkers can use their bodies to continue their work. But even when Kit confronts Madame Duret about it, some of the girls are okay with it, finding ‘fulfillment’ for the first time. Though those girls are hardly aware that their bodies and minds will be used up without their permission. The conclusion is a bit silly (though I’ll leave that out), but I think the first three-quarters of the film are pretty great. I was still surprised by it, despite having read the book. The twist still stands up and remains a feminist allegory. 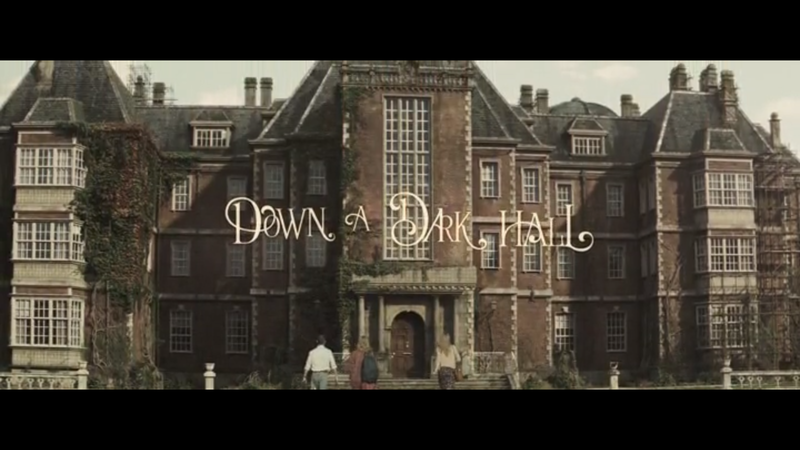 Down a Dark Hall is easily the best adaptation of a Lois Duncan novel (yes, perhaps even dethroning Summer of Fear). It manages to update Duncan’s 1974 novel without sacrificing anything the story was truly about. Yes there are ghostly things occurring here, but this is ultimately about a girl learning she deserves to have full autonomy over her body. Yes it can be a bit silly (it does come off as Twilight-era at times). I certainly wouldn’t call it perfect, but it does work with it’s own magic. Director Rodrigo Cortés does a wonderful job of creating a gothic atmosphere inside Blackwood. Much of this can be attributed to the absolutely stunning piano numbers from Víctor Reyes. Like nearly all of these adaptations of Lois Duncan’s novels, It throws in a higher body count than its source material. But it does make every death have some sort of weight, and it actually works. This might fall into the “guilty pleasures” category. That is, if I believed in such a thing as that.